Medical Appointment Transportation (MEDTRN) exists to provide safe, courteous and efficient transportation service to qualified ADA persons residing within the corporate limits of Ocean City, MD for the purpose of “medical appointments.” All medical appointment destinations must be located within 500 yards off of Route 50 and or within the corporate limits of Berlin, MD. The required MEDTRN fare is $5 per person, per boarding. Service is available Monday, Wednesday and Friday from 8 a.m. to 4:30 p.m. Advanced reservations are required. MEDTRN service is only available to ADA-qualified persons with disabilities residing within the corporate limits of Ocean City, MD. MEDTRN service is only for medical/dental/vision appointments located within 500 yards off of Route 50 between Ocean City and Berlin and or within the corporate limits of Berlin. All MEDTRN appointments shall originate within the corporate limits of Ocean City. MEDTRN fare is $5 per person, per boarding. Exact fare required. No discounts apply. Ocean City Resident Senior Citizen Passes are not applicable to this service. MEDTRN reservations must be made in advance with the Ocean City Transportation Dispatch Office (410-723-1606). Please call no later than 11 a.m. the day prior to your scheduled medical appointment. All reservations will be taken on a “first-come, first-served” basis. MEDTRN vehicle seating is limited. MEDTRN days and hours of operation are Monday, Wednesday and Friday from 8 a.m. to 4:30 p.m. The first scheduled MEDTRN “pick-up” will be at approximately 8:30 a.m. Please make every effort to be ready for “pick up” at your scheduled time and to schedule your medical appointments in accordance with MEDTRN hours of operation, allowing no less than 45 minutes for transport to/from your appointment. 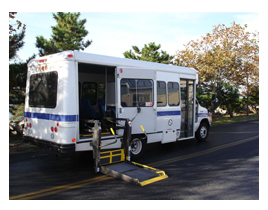 MEDTRN fare financial assistance may be available to qualified ADA persons through the use of “Fare Vouchers” as funding permits. To inquire further, please speak with a MEDTRN driver or call Ocean City Transportation at 410-723-1606. To help supplement the MEDTRN fare financial assistance program, private party donations will be accepted at the following locations: City Hall – 301 Baltimore Ave. & Transportation Dispatch Office 206 65th Street.